What a great looking team, right?! 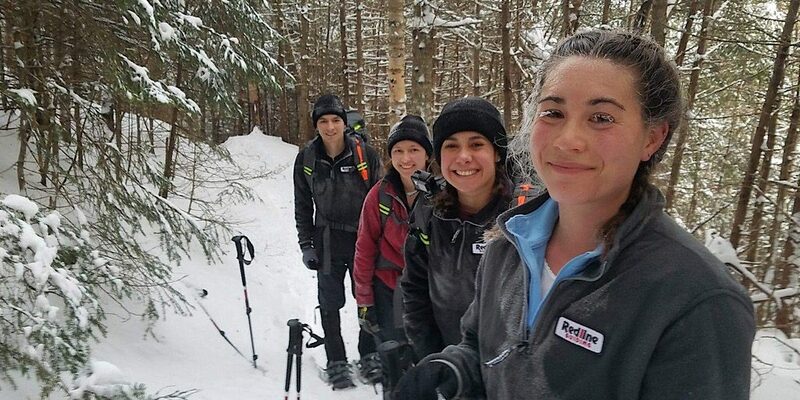 The patriarch of a family in Randolph, NH, contacted us late in the afternoon on the 29th with a request that we guide four young adventurers on a Mt Madison summit bid the following morning, two of which were his own kids. He sought us for our judgement and ability to ensure the safety and well-being of those most important to him. Given such extreme conditions forecast, he also requested we outfit his party with the winter/alpine version on our Ready Packs. When thinking about it, it’s quite the honor to have this responsibility, especially easy with the comfort knowing the gear we furnished is well suited and totally capable. Of the Northern Presidentials, Mt Madison at 5366-feet is the little guy, but long ago we learned to appreciate and respect the little guy. When approaching the mountain’s summit mound from the west — in typical fashion being via Valley Way to Osgood Trail (AT) — it limits the above treeline exposure to a mile. Specifically we mean a half mile up, and a half mile back because you can’t have one without the other. This is especially important when the weather calls for strong winds and brutally cold temperatures because lingering in such conditions is out of the question. On the job for this tour, even with the late notice, was Redline Guide Ken Hodges. Really, though, the whole thing started with them driving to North Conway the evening of the 29th to meet with owner Mike Cherim to get geared up, going over it all in detail, and then to sit down and have a critical hour-long conversation about what to expect, how to manage their gear, discuss self-care, team work, and so much more. It was a condensed but highly effective briefing. After the meeting the quartet returned to Randolph for the night with instructions to meet Ken at the Appalachia trailhead the following morning, Ready Packs at the, well… at the ready. They did. They were. 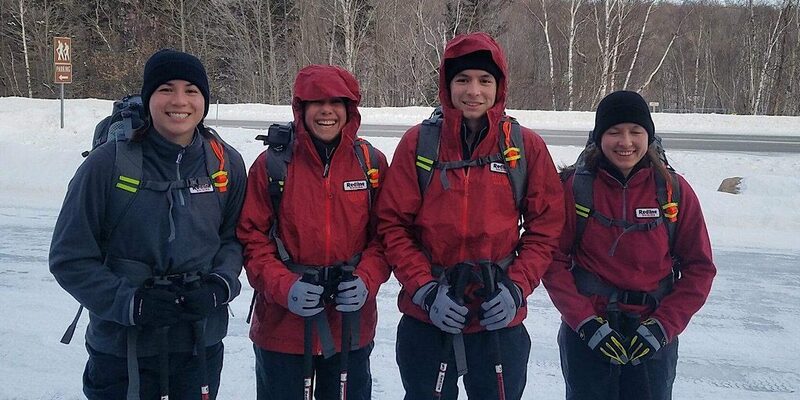 Mountaineering boots, hardshells, proper snowshoes for that hike. Food and water. We covered the bases for them. 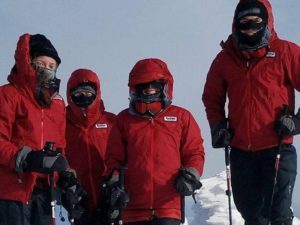 And as such, being that they were prepared and organized, they quickly got on trail and made effective use of their time on the mountain summiting despite the brutal ambient temperatures, strong winds, and dangerous wind chills. Ken didn’t provide a ton of photos which is understandable in such conditions. We get it. He had more important things to attend to, after all. But the photos he did get are fantastic. Ready at the start. Not over layered so in ten minutes or so they will feel great. Smart. A frosty trailside moment. Check out the eye lashes! Also check out the smiles, frozen in place no doubt. 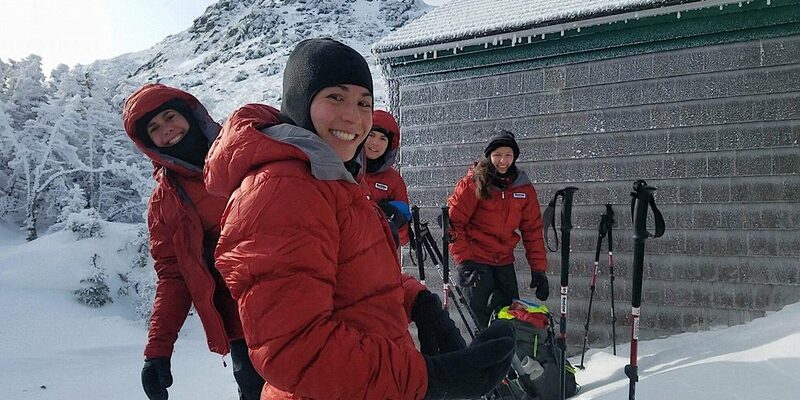 Adding layers by the (closed) AMC’s Madison Spring Hut in preparation for their summit push. 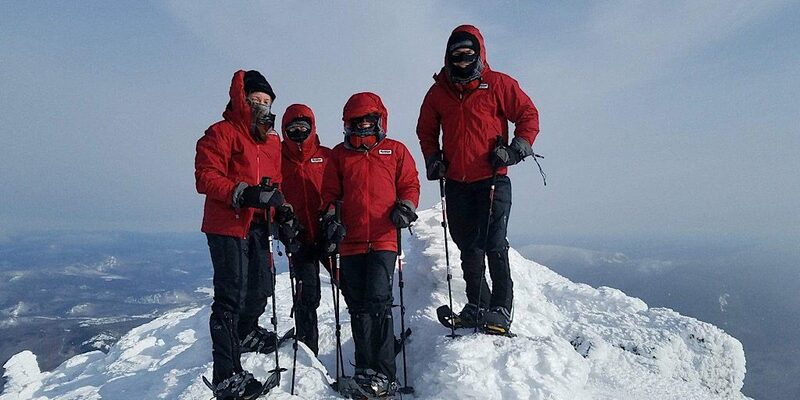 The team on the Mt Madison summit during some pretty extreme conditions. Well done team, one and all, congratulations on your summit. Fine leadership, Ken.